Enter your email address below to receive a notification when LaLa horse starts accepting new sign-ups! Enter your email address below to receive a notification when LaLa horse is accepting new sign-ups again. We ship mid-month to late-month, depending on the arrival of items for the boxes. Horse Loving Kids - This Is For You! 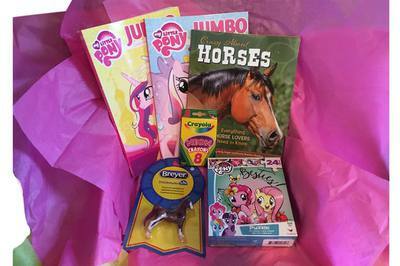 Elementary school-aged kids, this subscription box is for you! 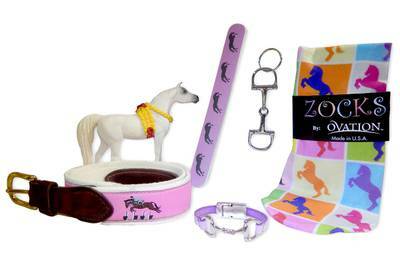 Every month you'll get a box full of horse-related goodies, such as socks, jewelry, toys, notepads, and more, as well as information about horses, created by real horse owners, trainers, and breeders! Toys, books, crafts, clothing, and more. 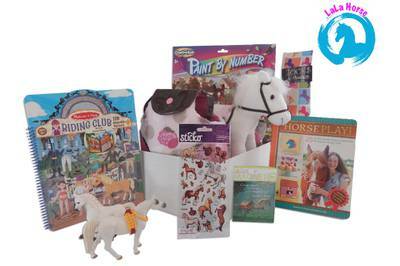 Fun, educational horse-related items for kids who love horses! My daughter was sent a LaLa Horse box for Christmas and she loved it! The box it came in was very attractive and we were excited to see what was inside. The gifts she discovered upon opening the box were great! She really loves horses, so the LaLa Horse box was a terrific present. I got this as a Christmas gift for my niece who LOVES LOVES horses. She is 9 years old. It just so happened that the 2 horses that were being featured were her favorites. I was happy with the products in the box. I only purchased one box due to being on a budget, but I know for future gift needing events, this will most likely be my go to gift for her!! As long as she still loves her horses. Thank you so much for helping me win AWESOME AUNTIE points.